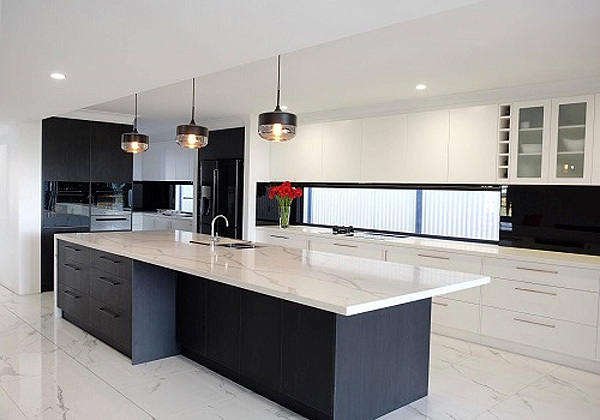 Go beyond the Caesarstone Kitchen Benchtops versus Granite Kitchen Benchtops debate by opting for the former variant from the one and only West Coast Marble & Granite in Perth. From a kitchen designer’s stance, Caesarstone gives a tough competition to the customary granite material, in terms of durability and styles. Manufactured from special resins and quartz, our collection of Caesarstone Kitchen Benchtop provides you ample reasons to opt it for your kitchen. It is robust, scratch and stain resistant, scoring high in practicality. Its uniform colour and smooth surface make it a low-maintenance product, while its superior heat resistant feature turns it into an ideal kitchenette addition. Appearing in diverse colour ranges, it never fails to suit the specifications that you are seeking. If you choose to brighten up your kitchen, go for light hues but if you wish to integrate an air of modernity, dark shades can be an irresistible option. Available in matte and satin finish, it lets you mimic the grandeur of natural stones. By featuring such qualities, it provides almost every homemaker with the joys of preparing meals, by backing them up with only the choicest of benchtops, both stylish and functional at the same time. Order the finest one for your kitchen from West Coast Marble & Granite, the distinguished benchtops manufacturer, supplier and installer in Perth.